We created the following scaled map to show the forecasted growth rates. 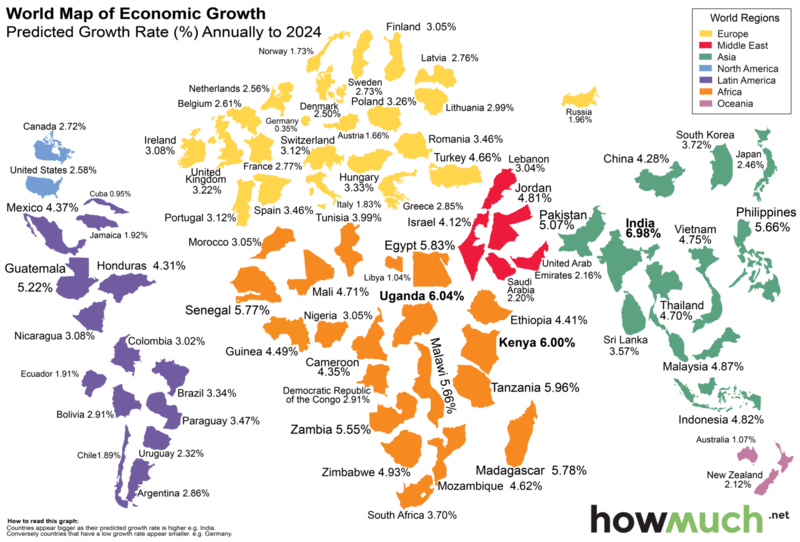 The countries are scaled according to their predicted growth rate. Thus, India appears larger than the United States with a predicted growth rate of only 2.58%. As can be seen from the map, India appears larger on the map than its neighbor China to the north. The CID believes that India will have the highest growth rate because of gains in productive capabilities. These gains have allowed the country to diversify exports into more complex products such as pharmaceuticals, vehicles and electronics. Historically, gains in economic complexity have resulted in higher incomes. There are a number of countries in East Africa that are projected to grow at least 5.5% annually. Five countries in the region appear on the top ten of the CID list including Uganda, Tanzania, Kenya, Malawi and Madagascar. In addition, there are countries in both the Middle East and South America that appear poised to take off. Jordan and Israel have projected annual growth rates in excess of 4%. Guatemala has a projected growth rate of 5.22%, while Honduras and Mexico are both over 4%. At the same time, economic growth is anticipated to slow in advanced economies. The U.S. is anticipated to only grow 2.58%. The U.K. is forecasted at a slightly higher 3.22%. Germany, one of the leading economies in Europe, is forecasted with an annual growth rate of only 0.35%. The CID also notes that economies based on commodity output face slower growth rates as commodity prices continue to remain under pressure. The CID uses economic complexity as their indicator for economic growth after a decade of research. This research has found countries that diversify their production knowledge beyond what is expected see faster income growth. This is a much more accurate indicator of future growth as compared with the popular World Economic Forum Global Competitiveness Index. For example, the CID says that Greece has been an outlier for having a higher income level than would be expected for its level of economic complexity. The country has struggled with average negative annual growth over the past decade. The CID says that looking at economic complexity may help policymakers. By finding ways to bring new production and product capability into a country, it could help to strengthen growth in the future. The key is getting the new knowledge to come into the area which depends in part on immigration policy, as well as education policy.